Ever wondered how to add a Facebook Like Button to your Blogger Post just like the one above? It's super easy. 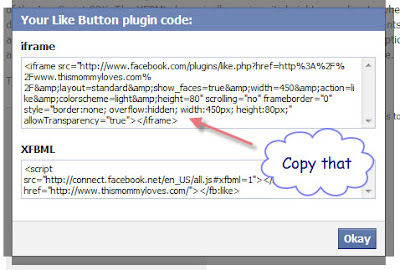 Just go to http://developers.facebook.com/docs/reference/plugins/like and paste the URL of the post to "like" and then click "get code"
A pop-up will appear with your code. Copy the iframe code and paste in the HTML of your blog post wherever you want it placed, usually at the beginning or end of the post. That's it! Hope it helps!